In this article, we’re going to be discussing the Best Winemaking Kits which exist in 2019. As always on LoveCraftWines.com, we like to hear what our readers think about our posts and articles, so if you’re looking to make a constructive comment, please feel free to leave one in the comments section at the bottom of this page. Ok, so before we dive into the exact units that we’ve featured on our list, we want to make sure that all of our readers are on the same page regarding what exactly a winemaking kit is, and who it’s for. What is a winemaking kit? Will a winemaking starter kit teach me how to produce different types of wine? Where can I buy a complete winemaking kit? Simply put, a winemaking kit comprises of all the winemaking supplies and equipment that a beginner winemaker would need to produce high-quality homemade wine. As we just mentioned, these kits are usually targeted more towards beginners who are unsure of all the equipment they require and therefore these kits are a fantastic way to ensure that you have all of the correct supplies. Whilst most of the winemaking kits will provide a basic guide on how to make fruit wines, there will be a limited amount of step-by-step guidance and video tutorials/demonstrations for more specific types of wine. Therefore, if you’re interested in learning about the different types of wine that you can make, you’ll want to become a member of The Home Wine Makers Inner Circle, which includes access to their Complete Winemaker’s Video Library, an Illustrated Guide to Homemade Wine and several additional bonuses… After all, you’ll want to learn from experienced winemakers and avoid the mistakes that most beginner winemakers usually make. Well, we’ve researched what the best winemaking kits are, taking into account customer ratings, reviews and our own research on each the features, benefits and potential drawbacks of each. With that being said, we’ve featured all of the top-selling and top-rated winemaking kits that passed our quality-checking process. As for where you can purchase a complete winemaking kit, well the best place is Amazon! Why? Because only the best, most reputable and value-driven brands do well on their platform, helping ensure that you get a quality product. With all that being said let’s now talk about what the best wine-making kits are? This Fresh Harvest homemade fruit wine making kit by Master Vintner is the most affordable wine-making starter kit that we have the pleasure of featuring upon this list. 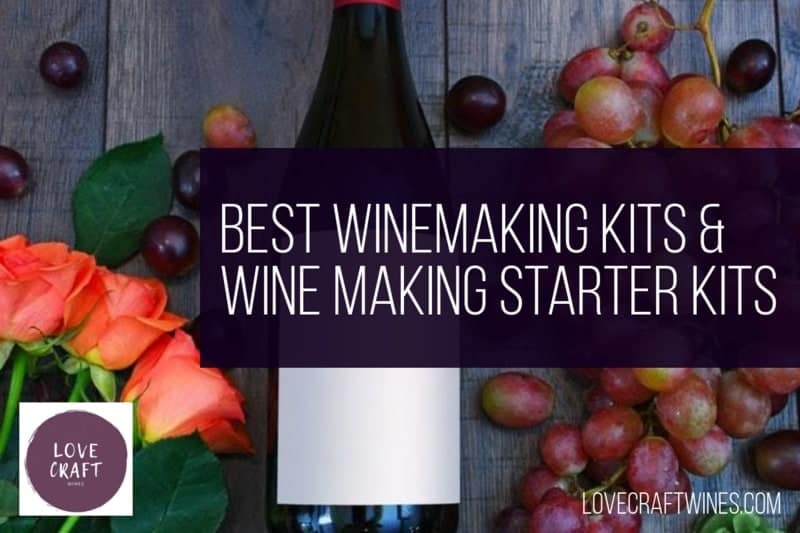 Despite the kits affordability, don’t mistake this for a lack of value… Because this kit provides a beginner winemaker with nearly everything (besides from bottles, corks, corker and fruit) that he/she will need to get started winemaking. One aspect we’re particularly fond of when it comes to Master Vintner’s products, is that they provide an exceptional level of customer support, including phone, email and text support which is available 7-days a week, and with their company stating that they provide a 100% Satisfaction Guarantee. The kit comes with enough supply to make 15 gallons of fruit wine, and because it has a 1-gallon fermenting jug, this means that you can make 15-lots of 1-gallon batches of wine. 1 gallon (3785.41 ml) will be enough to fill 5 bottles of 750 ml wine, so you’ll have more than enough to stock up between making batches. However, this kit does not come with a wine thief, so we suggest purchasing the following one here: Wine Thief Recommendation on Amazon. Overall, we think that this is a fantastic kit for someone starting out in winemaking, who doesn’t necessarily need to create large amounts of wine (over 1 gallon) in 1 batch and is happy making it in 1 gallon lots. This 1-gallon winemaking economy kit by North Mountain Supply is another extremely affordable beginner wine-making starter kit. It includes most of the equipment that you’ll require to start making fruit wine of your choice, but this particular kit does not include corking equipment. 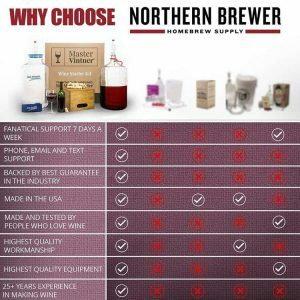 We’ve also featured the North Mountain Supply WineMaker’s Complete Kit here if you’re interested in getting the corking equipment included within the kit, which is something that we recommend for most beginners. However, this kit (not containing the corking equipment) is ideal for someone who potentially already has corking equipment or access to the equipment from a friend. One aspect that we particularly like about North Mountain Supply is their 30-day hassle free replacement of any equipment, meaning that you can rest assured knowing that everything will work perfectly, or if it doesn’t, can be easily replaced. Additionally, the customer reviews & ratings of this product are very positive, so we think that it’s another great choice for readers. Overall, we recommend beginners look at the North Mountain Supply WineMaker’s Complete Kit, but if you have corking equipment already, this one is ideal. This Cabernet Sauvignon winemaking starter kit by Master Vintner is perfect for the aspiring/beginner winemaker who just wants a small, 1-gallon batch winemaking kit to create their own Cabernet Sauvignon wine. The kit includes a primary fermentor, 1-gallon glass jug secondary fermentor, 1 hydrometer, test jar, corker & corks “… and everything else you need to make truly fine wine“… And therefore, when correlating this with the incredible feedback that this product has, we’re certain that you’ll be satisfied, and they’re certain too, because of their “100% Satisfaction Guarantee” statement. The brewmasters at Master Vintner’s also have detailed step by step tutorial videos for their particular products, making it easy for you to create the perfect batch of Cabernet Sauvignon wine, which will be extremely impressive when your family and friends try it. This Merlot winemaking starter kit by Master Vintner is perfect for the aspiring/beginner winemaker who just wants a small, 1-gallon batch winemaking kit to create their own Merlot wine. The brewmasters at Master Vintner’s also have detailed step by step tutorial videos for their particular products, making it easy for you to create the perfect batch of Merlot wine, which will be extremely impressive when your family and friends try it. This Pinot Noir winemaking starter kit by Master Vintner is perfect for the aspiring/beginner winemaker who just wants a small, 1-gallon batch winemaking kit to create their own Pinot Noir wine. The brewmasters at Master Vintner’s also have detailed step by step tutorial videos for their particular products, making it easy for you to create the perfect batch of Pinot Noir wine, which will be extremely impressive when your family and friends try it. This 1-gallon complete wine-making kit by North Mountain Supply is another extremely affordable beginner wine-making starter kit. It includes everything that you’ll need to begin making your own homemade wine, besides from the actual fruit/fruit juice. Overall, we cannot fault this kit… It has some great reviews and makes the process of winemaking simple & easy. The Deluxe Wine Making Kit by Strange Brew is a product which has overall gotten fantastic customer reviews. It comes with an instructional DVD which is fantastic for any beginner who wants that kind of instructional media. Upon looking at the capacity of the primary fermentor and carboy, it’s clear that this unit is more ideal for someone looking to make a large batch of wine, given that the primary fermentor has a 7.8-gallon capacity and the glass garboy has a 6-gallon capacity. You may be asking, “can I not just purchase this unit and fill up the fermentor to 1 gallon or 2 gallons worth of wine”, and despite this being a good question, we suggest that you don’t do this, especially as a beginner, as you want to eliminate any empty space in the carboy (6-gallon capacity) in which potential gasses can accumulate which could in turn change the freshness, smell and taste of your wine. Overall, this is ideal for the beginner who’s looking to make a lot of wine at once, but consider 1-gallon is the equivalent to 5 bottles of 750ml wine… So you’ll be filling over 30 bottles with this winemaking equipment in one batch… which means that you can let wine age, which is great for as long as you have the room to store it. However, if you’re considering this unit, we suggest taking a look at the Master Winter Home Wine Making Equipment Starter Kit – 6 Gallon before you go ahead and purchase. The 6-gallon winemaking kit by Home Brew Ohio is a more premium-priced unit, and we can understand why considering that it can handle up t0 6 gallons of wine per batch, and because it’s created by such a reputable, well-known brand. The product itself has some very positive review ratings, despite there only being a handful. Each review suggests that the kit is ideal for beginners, and one review even goes so far to suggest that the company are incredibly helpful and accommodating, with the circumstance entailing that an item in the kit was mistakenly placed, so the customer got in touch with the company, who responded immediately and sent one out a replacement which arrived the following day. Similar to the previous kit, this kit does not come with a wine thief, so we suggest purchasing the following one here: Wine Thief Recommendation on Amazon. Overall, this is another good choice for those beginners who want a wine-making kit which is more ideal for creating larger (6 gallon) batches of fruit wine. Just remember that 1-gallon is the equivalent to 5 bottles of 750ml wine… So you’ll be filling over 30 bottles with this winemaking equipment in one batch. As we’ve mentioned before, we prefer the next winemaking starter kit, which is the Master Winter Home Wine Making Equipment Starter Kit – 6 Gallon, so potentially take a look at that before making your final purchasing decision. The Master Winter Home Wine Making Equipment Starter Kit is a 6 Gallon capacity unit, which is manufactured by one of the leading wine-making companies within the industry, renowned for their expertise and impressive reputation. Master Vintner make the statement that this winemaking kit is “Compatible with any Wine Ingredient Recipe Kit” and with it being backed by their company’s fantastic “100% Satisfaction Guarantee” which also includes Phone, Email and Text support 7-days per week, we think that you really can’t go wrong with this kit. Ideally, you’ll want to create a bulk amount of wine with this kit, and because 1-gallon is the equivalent to 5 bottles of 750ml wine… you’ll be filling over 30 bottles with this winemaking equipment in one batch… Which means that you’ll need some space to put this wine, a wine rack for your red or a wine cooler for your white wines. Take a look at our review recommendations on the best undercounter & built-in wine coolers for a great selection. The 6-gallon winemaking kit by Home Brew Ohio is the most premium-priced unit featured on the list, and we can understand why considering that it can handle up t0 6 gallons of wine per batch, and because it’s created by such a reputable, well-known brand. This particular winemaking starter kit features more accessories than the previously mentioned 6-gallon winemaking kit… Such as the wine thief and other helpful wine accessories. Similarly to their slightly lower-priced unit, this premium winemaking starter kit also has some very positive review ratings, despite there only being a handful. Overall, we think that this product is a solid choice and if you like the look of this particular unit, feel free to purchase it. Although, for us, we prefer the Master Winter Home Wine Making Equipment Starter Kit which is still a 6-gallon unit, and is manufactured by a company who are known for their incredible customer support. Ok, so we’ve provided the following recommendations based on 2 basic factors, price and the amount of wine that you want to create per batch. Lovecraftwines.com is a participant in the Amazon Services LLC Associates Program, an affiliate advertising program designed to provide a means for sites to earn advertising fees by advertising and linking to amazon.com.